This Old Gal’s Simple Guacamole Recipe, made with Fresh Ingredients is a 5 minute recipe, which will blow you away. It is as good as you get at fine Mexican restaurants, where they make the Guacamole right at your table. There is a place in West Palm Beach, Florida, which makes the best Guacamole. I briefly talked about their tacos and guacamole in my Creamy Baja Fish Tacos White Sauce recipe and my Air Fryer Baja Fish Tacos recipe, a few weeks ago. It’s a cute little joint, called Rocco’s Tacos. Ed and I used to frequent the restaurant quite a bit, as we love their fish tacos. 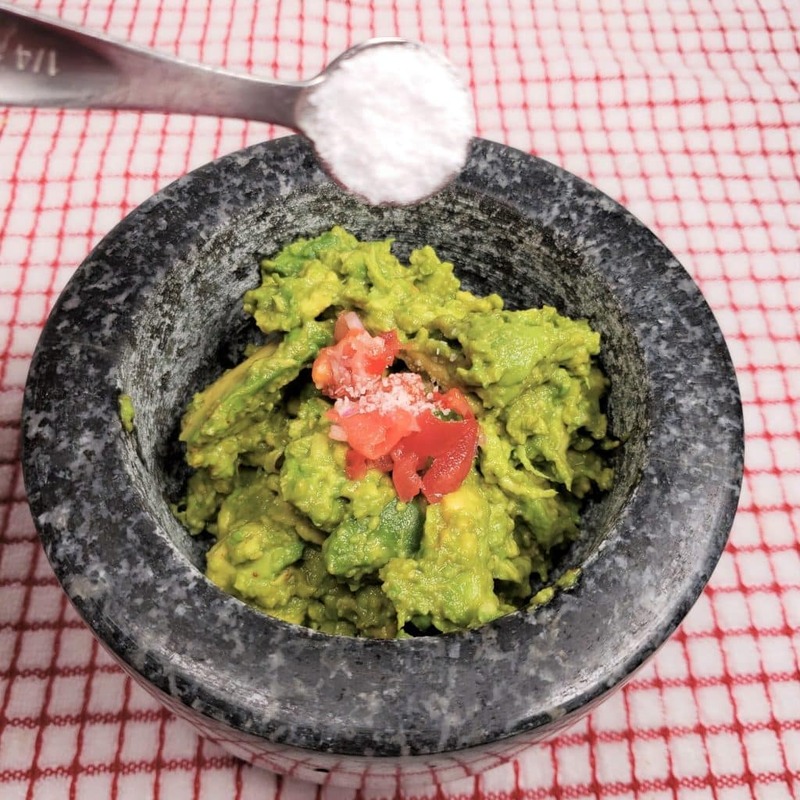 Do you want to know the secret to great Guacamole? 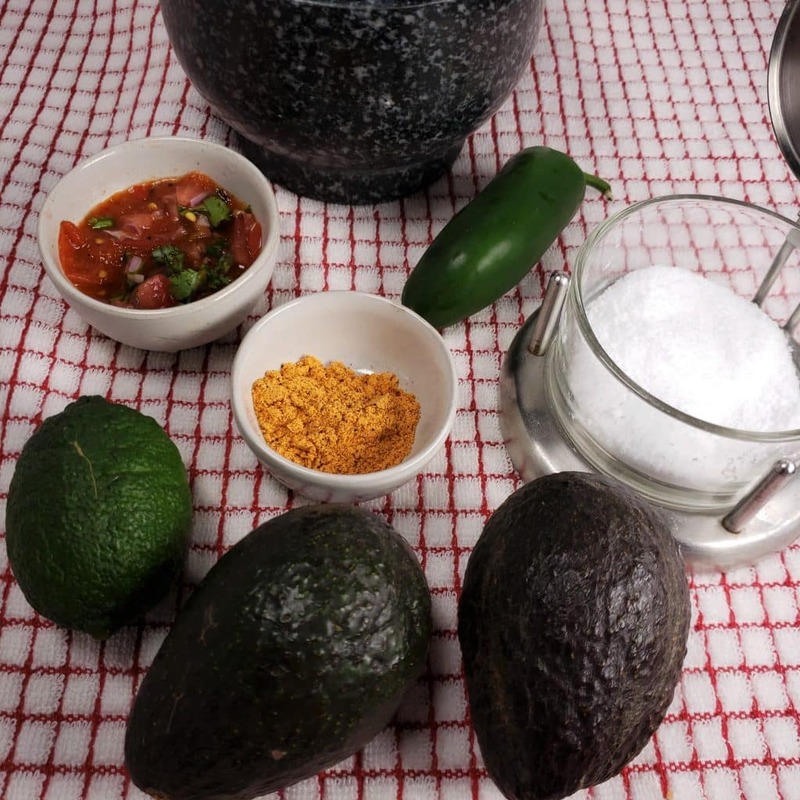 While sitting at the table, watching the Guacamole person prepare the Guacamole in their Handmade Lava Rock Molcajete for our table, I kept my eye on the ingredients. There weren’t very many and I was determined to replicate the process, but making it even better. I think I can safely promise you that this recipe will be the easiest and quickest Guacamole recipe you have ever made. I also kind of feel confident in betting you that it will also be the best. Very often, simple is best, right? The Avocado is the star and needs to shine. I’m serious, I was floored at the results and frankly, I never had any feelings that I wanted to change anything. From that first time back when I created my recipe in 2011 and then listed it for sale on ebay on January 6, 2012, I knew that was it! The secret is, less is more. The Avocado should be the star of the show and the other ingredients are background day players. No one spice should over power the fresh Avocado flavor and texture. As I learned to love Avocados while living in California (see my notes on that in my Air Fryer Crispy Avocado Fries recipe), Hass Avocados were my Avocado of choice. However, after returning to Florida for a few years where Hass aren’t always available, I started to appreciate the Choquette, Hall and Lulu Avocados and sometime chose them over the Hass, for a less “oily” taste. But, my go to are the Hass and they are what I used when I first created this recipe in Florida. With my quick and easy method, you will only need a few ingredients. I was in a hurry one day and was craving Guacamole, and decided to use what I had on hand. It was as good as Rocco’s Tacos, if not, even better! Of course, I love to get into the mood, so I use a Handmade Lava Rock Molcajete. It is usually a round bowl with three legs. 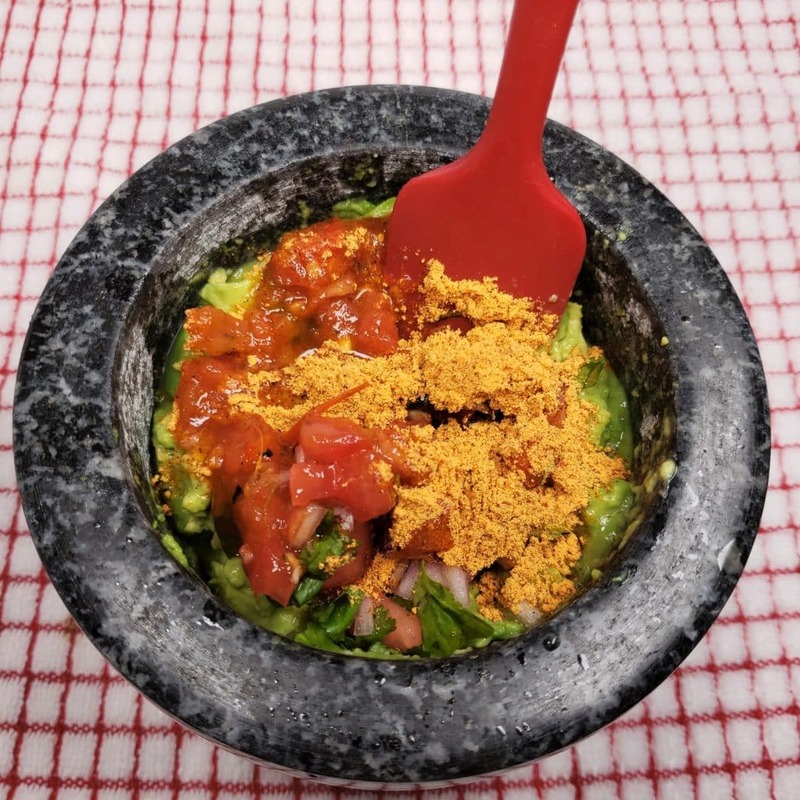 An authentic Molcajete is carved out of one piece of lava rock. There are also some made from Marble or Granite. Inside the Molcajete, the surface is quite rough, which makes it perfect for grinding and crushing spices. Seasoning the Molcajete prior to first use is imperative, which is explained below. Much like Cast Iron, Molcajete‘s get better over time, as they carry over their flavors from one use to the next. Molcajetes are used to make Guacamole and Salsa. Make sure to properly cure the Molcajete first, before using. How do you season a Molcajete? You will need to soak your Molcajete in water for a couple of hours and then let it air dry. Add a handful of Rice and pound it with the pestle until it is powder. The powder will be grey in color. Repeat this step until the rice flour is no longer grey. Then add a Clove of Fresh Garlic, Fresh Cilantro, Cumin Seeds and Kosher Salt. Smash that up into a paste and let it sit in the Molcajete overnight. 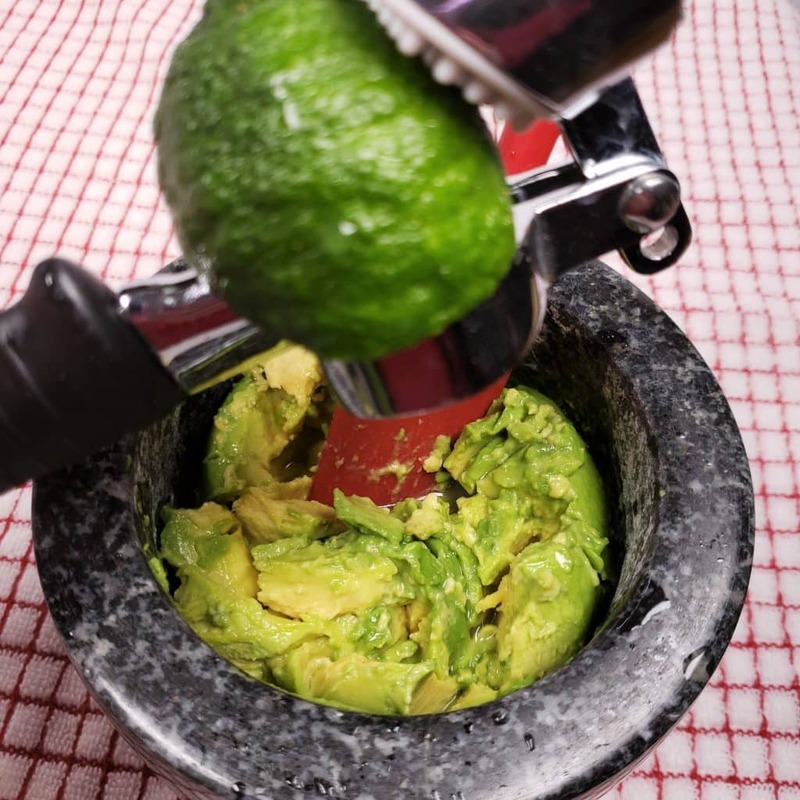 It may take a few batches of my This Old Gal’s Simple Guacamole to fully season your Handmade Lava Rock Molcajete, but it will be totally worth it. You know how after your Cast Iron Skillet has become nicely seasoned thing just cook better? Fresh Limes are always the best and I enjoy a good dosing of Fresh Lime Juice. If you cannot get Limes in your area, hopefully you have a bottle of True Lime Crystallized, which you can sprinkle in a Tablespoon of fresh water and pour that over the Avocados. It works, just like Fresh Lime juice, which will keep the Avocados from turning brown and will also add a Fresh Lime taste. A Lemon/Lime Squeezer works best to squeeze out all the juice from a fresh Lemon. Mine is still packed somewhere, so I used a Garlic Press, which actually worked! Years ago, when ebay allowed the sale of single recipes on ebay, my Guacamole was a popular item. So popular in fact, that Rocco himself sent me a message about my recipe. Long story short, my ebay listing was removed cause I mentioned the name “Rocco’s Tacos) and I received a violation. I contacted Rocco, who had his attorney contact ebay and straighten it all out and said it was in error. An error, which turned out to be positive, as we received special treatment from Rocco when we visited his restaurant. 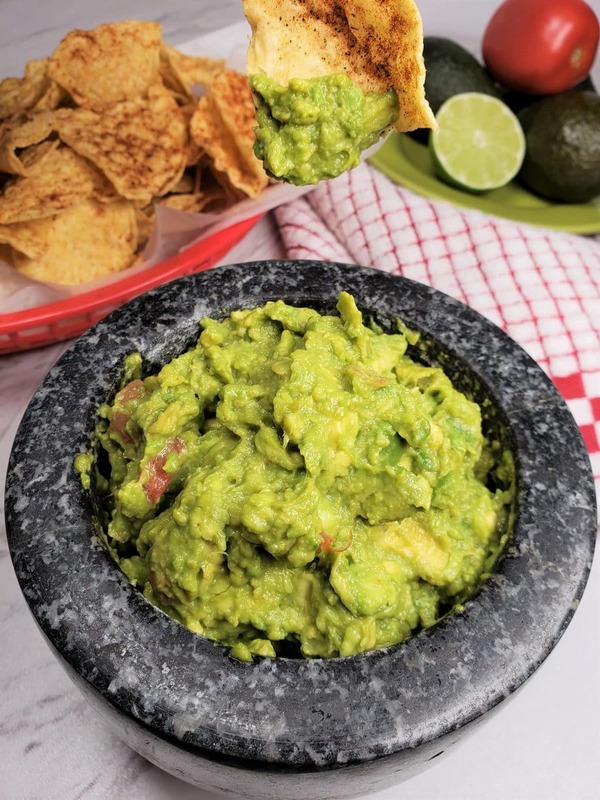 But, when I first created my This Old Gal’s Simple Guacamole (back then, it was just “my Guacamole), I did so using McCormick Taco Seasoning Mix, since I had a packet in my pantry. If you have every made my Pressure Cooker Drive Thru Tacos & Burritos recipe, I list out all the ingredients for my special Taco Mix. I keep a jar of my mix on hand at all times. Sure, it is better when you use your very own spice mix, but McCormick Taco Seasoning Mix, is fine to use here. Be gentle when you fold in the veggies and the seasonings. I do use fresh salsa, which is super easy to make yourself. My Taco Seasoning Mix is perfect to use for my Guacamole recipe if you happen to have a batch on hand. Since this is my “Simple” recipe, I use Fresh Salsa or Pico de Gallo found in the refrigerated section at Costco or Publix. You can also use your favorite jarred Salsa or Pico de Gallo, like Tostitos Chunky Salsa or Pace Chunky Salsa if you like. My easy to make Classic Pico de Gallo recipe is also perfect to use in place of a wet Salsa. 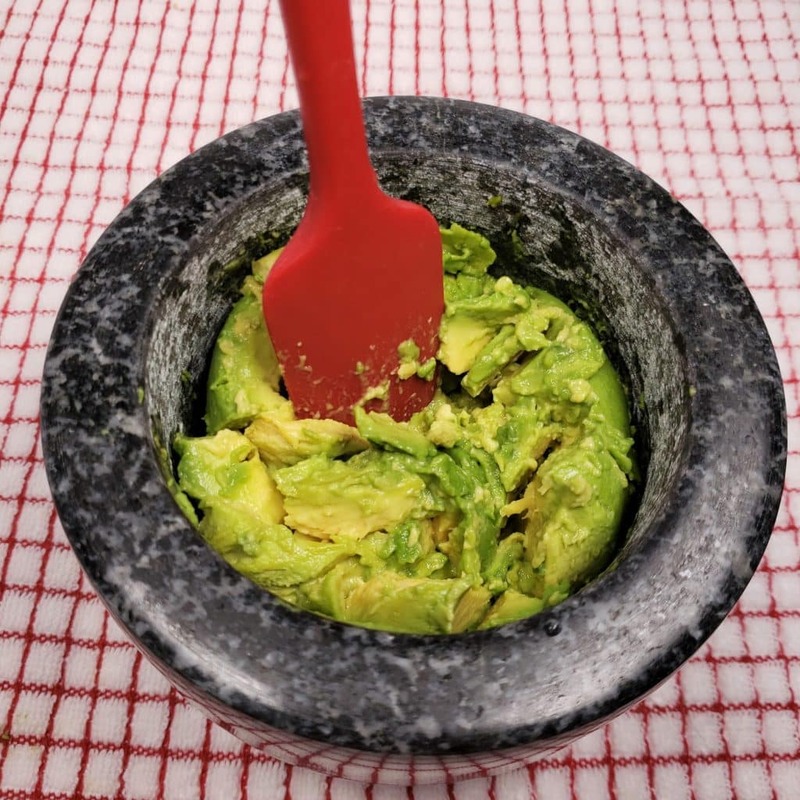 While IMO it is not as good as using the fresh stuff, you will still enjoy my Guacamole recipe. 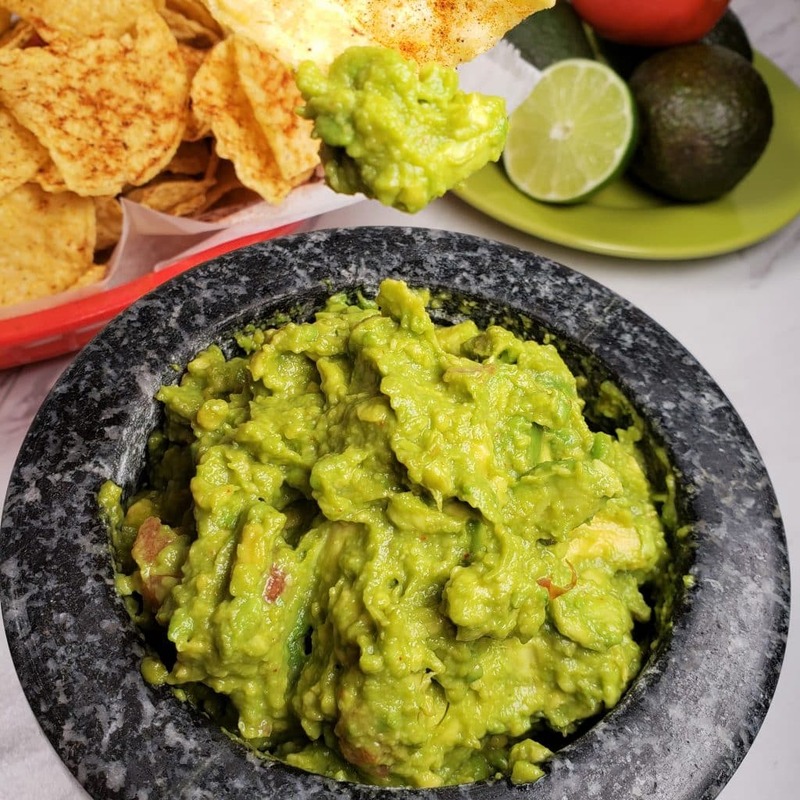 Enjoy my This Old Gal Simple Guacamole as an appetizer or along side my Pressure Cooker Pork Carnitas or on top of my Pressure Cooker Chicken Taco Bowls. Warm Tortilla Chips with some Ground Chili or Paprika sprinkled on is very yummy with my Guacamole. For a Low Carb and Keto option, use Pork Rinds. If you want to spice it up, add a little minced Jalapeño Peppers. 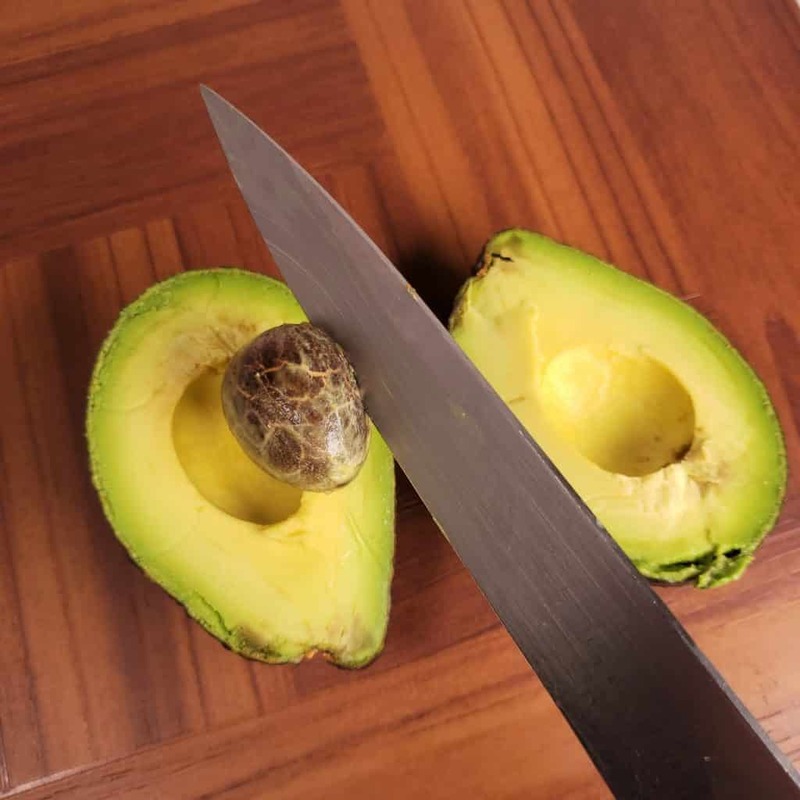 Cut avocado in half and remove the seed. With a tablespoon scoop out the meat and place in serving bowl. Cut lime in half and squeeze juice over avocado. 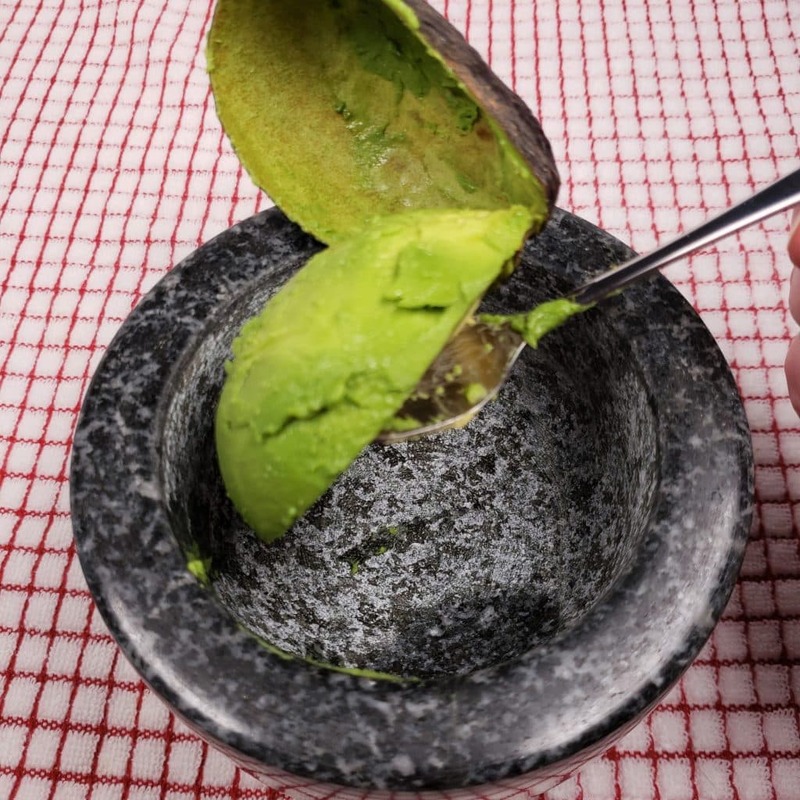 Using a tablespoon, gently break up the avocado so that you have large chunks. Add the salsa and the salt. Sprinkle the taco seasoning over the top. Gently fold together so that you have chunky Guacamole. IF you don't want to make your own Taco Seasoning, use the McCormick Taco Seasoning Mix that comes in little packets. It has all the spices you need in the proper measurement. One packet will make approximately four batches of awesome Guacamole. PIN this This Old Gal’s Simple Guacamole! Thanks so much for sharing this recipe. I have been looking forward to it ever since you mentioned you were going to be posting it. We love quacamole! Another excellent recipe!